Portable and fully featured with a large 4.3-inch wide screendisplay,bluetooth handsfree, multimedia functions, optional traffic re-routing and powered b a GPS/Galileo Dual Core processor, carNAVi ProBT is your ideal personal navigation guide. carNAVi leads your way with voice guided turn-by-turn directions in English or Tagalog to get you there on time and keep you safe on the road. 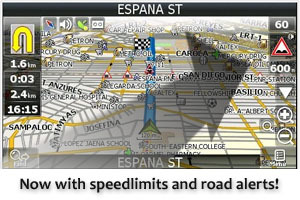 Preloaded with a high detailed roadmap with 2-D or 3-D map view with elevated flyover, tunnels and smooth map updates, covering the whole Philippines including many thousands of points of interest (POI), preinstalled detailed maps of Malaysia and Singapore and a worldwide map of major roads and highways, it’s compact, versatile and easy to use. Additional detailed maps* of Cambodia, Indonesia, Vietnam, Taiwan, Hong Kong, Thailand and many other countries are available free of charge. The benchmark in it's class, powered by a 64 channel SiRF Atlas IV Dual Core GPS/Galileo processor carNAVi PRO BT is faster than most other GPS receiver by comsuming less energy for longer battery life and faster satellite detection. carNAVi PRO BT is Galileo ready, future compatible to the new more accurate navigation standard.